Fall is definitely in the air and I couldn’t be more excited about it! Fall is my favorite time of year because I love the weather, the leaves, Halloween, and of course the food! Are apples good for dogs? Yes, of course but there are some precautions you should know about. I would like to add that you shouldn’t feed the apple core or seeds to your dog. I recommend getting an apple corer when making treats for your dog. Use common sense and practice moderation with any treats outside of your dog’s normal diet. If you are unsure about feeding them apples, please contact your vet! I recently posted a Frozen Apple Dog Treat Recipe and wanted to share a few more apple dog treat recipe ideas for dogs that I thought looked irresistible. 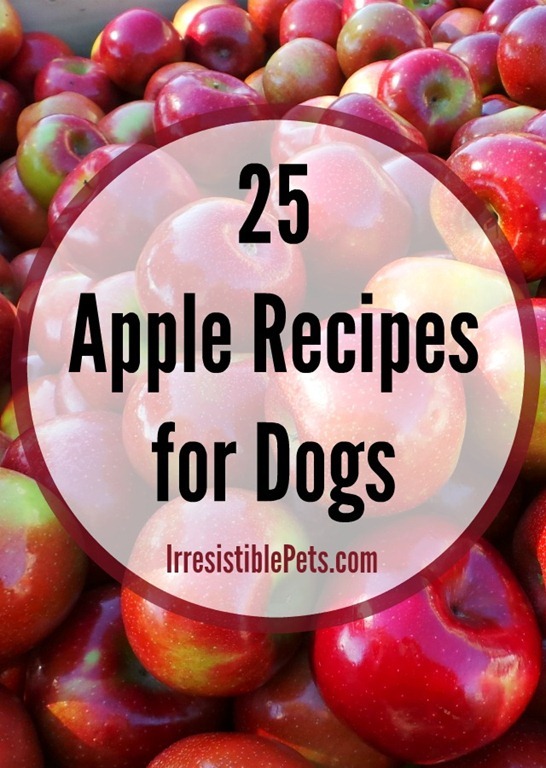 Know of an irresistible apple dog treat recipe that’s not listed here? Leave a comment below, so we can add it to the list! My dogs love apples! The peanut butter apple one looks tasty, as does Sugar’s banana apple pumpkin. Thanks so much for including our Apple Pupcakes! What a great roundup of ideas 🙂 – sharing! Thanks for including our Ginger Apple Treats in your roundup! We’ve done a few other apple treats (a frosty mint/apple treat too!) — it’s a great ingredient for some quick, easy dog treats!